17.0" x 16.1" stitched on 14 count. 13.2" x 12.6" stitched on 18 count. Puzzle Mat cross stitch pattern... This counted cross stitch pattern of a Puzzle Mat was adapted from art copyright of Linda Murray. http://www.etsy.com/shop/ClipArtCorner. 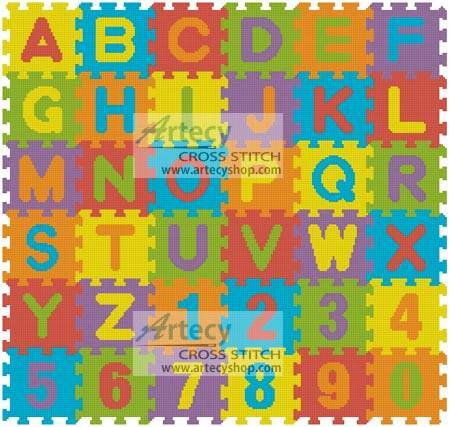 Stitch the whole design for a Childs room, or select segments to spell out a Childs Name and use any colors you like.